Welcome to 0.8.7! This is a landmark release which adds two new cloud providers, one pseudo cloud provider, and an exciting, flexible new configuration format! Don't worry, the old config format will still work, and you can wait to migrate to the new format when you're ready. However, the old and new formats are not compatible, so don't try and mix them. Some packages have been made available for salt-cloud and more on their way. Packages for Arch and FreeBSD are being made available thanks to the work of Christer Edwards, and packages for RHEL and Fedora are being created by Clint Savage. The Ubuntu PPA is being managed by Sean Channel. 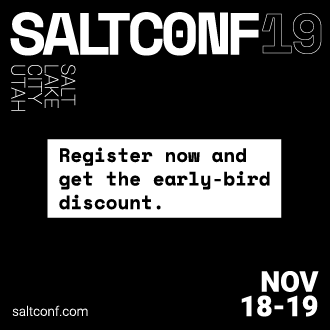 Package availability will be announced on the salt mailing list. As mentioned above, X-Mission was kind enough to lend us the resources to write a cloud driver for Parallels-based cloud providers. This driver requires only a user, password, and a url. These can be obtained from your cloud provider. DigitalOcean has been a highly-requested cloud provider, and we are pleased to be able to meet the demand. Only a client_key and an api_key are required for DigitalOcean. This is a massive change that we have been wanting for months to add. We would like to extend special thanks to Pedro Algarvio (s0undt3ch) for his tireless efforts, which included significant changes to the codebase. The old configuration format will still function as before, so there is no pressure just yet to move over. However, the configuration formats are not compatible with each other, so when you're ready to switch over, make sure to switch everything over at once. Keep in mind that if there is only one configured provider with a specific name, you do not have to specify an alias. But if multiple are set up as above, you must use the aliased name. Because it copied all of the configuration from development-instances, and overrode the provider with a new provider.